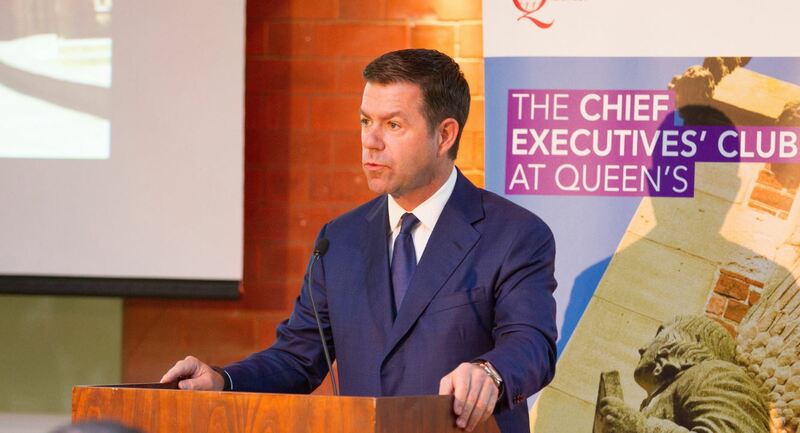 Queen’s University has awarded the Irish-American entrepreneur, businessman and philanthropist Declan Kelly - Chairman and CEO of global consulting company, Teneo Holdings - an Honorary Professorship at Queen’s Management School. Mr Kelly was awarded the prestigious Professorship during the Chief Executives' Club inaugural Annual Leadership Lecture at Queen’s Management School on Tuesday 12 September, at which he was the guest speaker. From journalism to consulting, Mr Kelly has had an impressive career and is widely known for his corporate problem solving skills, due to the impact he has had on the American corporate world. His company, Teneo Holdings, provide services that span the range of strategic communications; government affairs, investment banking, cyber security and risk management, management consulting, investor relations, corporate governance, advisory and executive recruitment, amongst many others. Mr Kelly is an advisor to several of the world’s leading CEOs and corporations and is recognised in particular for his crisis management experience. In 2009, he acted as US Economic Envoy to Northern Ireland after being appointed to the post by the then US Secretary of State Hillary Clinton. He is acknowledged as having helped bring significant investment to the province from US corporations. He also supported efforts leading to the local devolution of policing and justice powers, giving Northern Ireland fully devolved political governance for the first time in its modern history. Mr Kelly has also worked for FTI Consulting (FTI), one of the world’s leading international consulting companies and was Chairman of Financial Dynamics (FD) in Ireland, prior to which he owned Gallagher and Kelly Public Relations and worked as a journalist. A graduate of the National University of Ireland (Galway) he received an honorary doctorate from Queen’s in 2011 in recognition of his service to the community and economy of Northern Ireland. Mr Kelly founded the United States/Northern Ireland (US-NI) Mentorship Programme, which he still personally funds and oversees. The programme is designed to offer recent graduates from Northern Ireland an opportunity to gain business and managerial experience in the United States in order to broaden perspectives and entrepreneurial flair. Almost 100 students, including 39 Queen’s University graduates, have participated in the programme, spending a year in the United States working in some of the world’s leading companies. In his role as Honorary Professor, Mr Kelly will be a Visiting Professor in Management and Leadership and will act as an ambassador for the University in the United States. Media inquiries to Zara McBrearty at Queen's University Communications Office, on tel: +44 (0)28 9097 3259.